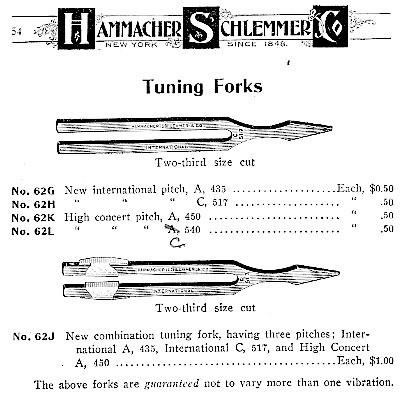 Even in 1918, H. S. and Co. did not include an A440 fork! Surprisingly, an A450 fork was still being sold. These high pitched forks are quite uncommon today; they must have been thrown away en masse. 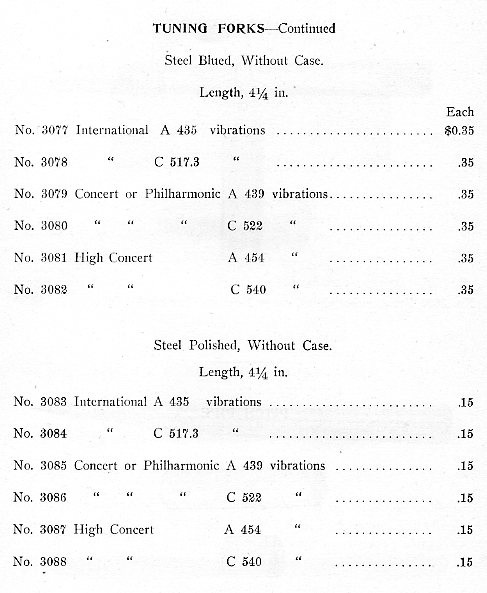 Table of Pitches from J.& J. Goddard 1920 catalogue. 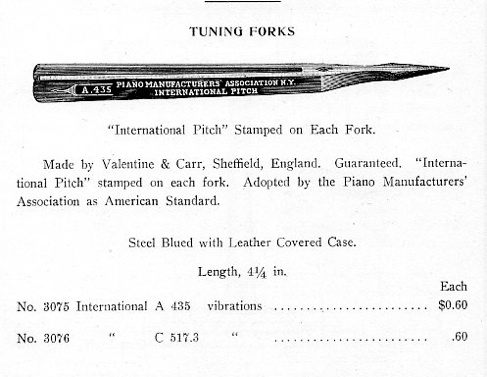 Inscription on A440 tuning fork. “Universal Low Pitch”: A440. The French commission included the following people: J. Pelletier, President, F. Halevy, reporter, Daniel Auber, Hector Berlioz, Despretz, Camille Doucet, Lissajous, General Mellinet, Giacomo Meyerbeer, Ed. Monnais, Gioachino Rossini, and Ambrose Thomas. Old French fork which is sounded by pulling the brass ferrule of the case through the small opening between the tines of the fork. This fork with a brass pedestal has a low pitch of around A423. 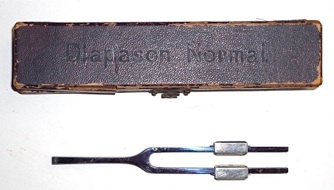 Diapason. Illustration from Il Pianoforte; Guida Pratica by Giacomo Ferdinando Sievers, published 1868 by Ghio, Napoli. 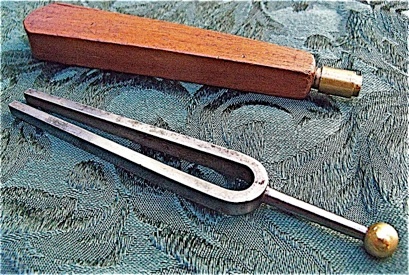 Another adjustable tuning fork, early 20th century. The higher the bridge (away from the crotch of the fork), the lower the pitch, and the lower the bridge, the higher the pitch. The example below has individual adjustable weights, which, when moved to their seven adjustment points, approximate seven (c to f#) semi-tones of the equally tempered scale. 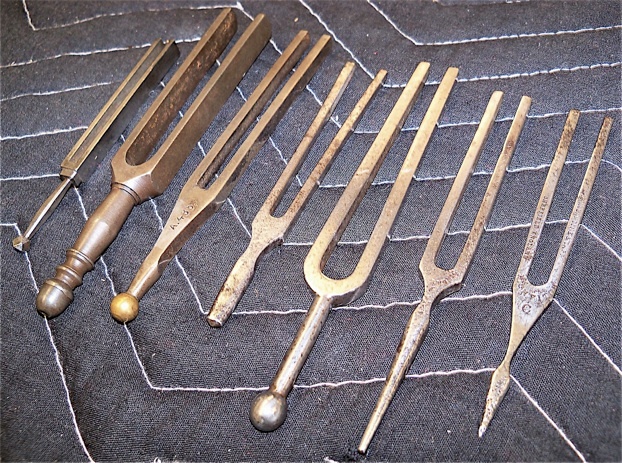 Here are a range of old tuning forks of various forms, ranging in pitch from A422 to A453. 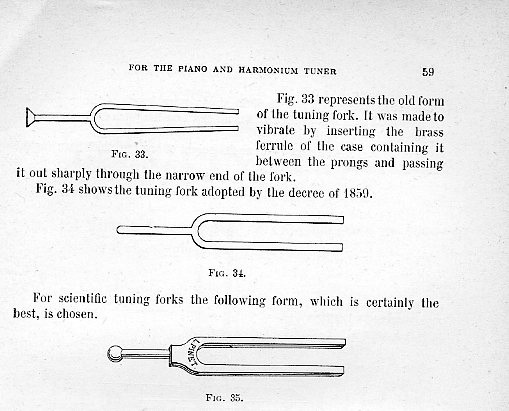 Dr. Edward Swenson has written an excellent article which includes a comprehensive list of many pitches produced by various tuning forks, starting from the time of the invention of the tuning fork by John Shore in 1711.